Twitch today announced several changes are coming to its mobile app, including the ability to livestream directly from the app and a brand-new interface. While the update won't let streamers broadcast games from their phone just yet (sorry, any on-the-go Hearthstone players), it will allow for live broadcasts from your device's camera. Twitch on mobile is also receiving a major overhaul to its UI, helping it function more like its big-brother desktop counterpart. New features include a navigation bar, a Dark Mode for easier-on-the-eyes nighttime viewing, Instant Playlists, and a Pulse feed for content recommendations. Today's app update is just one of many initiatives undertaken by the Amazon-owned streaming service to boost its audience. Other changes of late include opening its own game store, offering free in-game goodies to Twitch Prime subscribers, and encouraging content beyond gaming such as cooking programs and even woodworking streams. 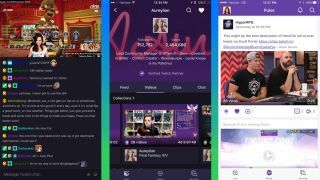 Twitch's updated app rolls out starting today for iOS and Android devices, but isn't expected to be available to everyone until "early July." In the meantime, consult our guide to using Twitch so you can get a headstart on your streaming career.